Christmas in Piazza Navona, in Rome. 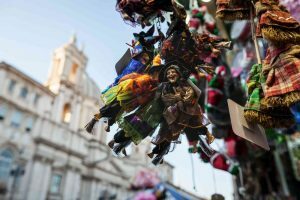 Vendors sell La Befana dolls throughout the season. On Christmas Eve, American children eagerly await a portly, bearded man by the name of Santa Claus. He zips through the night sky on a sleigh pulled by eight reindeer and squeezes through chimneys to deliver presents to good boys and girls. The story of Santa Claus (or Saint Nicholas) is consistent throughout North America, but other parts of the world have their own variations of the holiday icon. Discover how four different countries celebrate Christmas! In Italian folklore, an old woman named Befana delivers gifts to children on the night of January 5 (Epiphany Eve). She fills their socks with presents if they’re good, and dark candy if they’re bad. Rather than cookies or milk, Befana prefers the family leave a small glass of wine and a plate of sausage for her to snack on as she travels throughout Italy. She’s commonly portrayed as an elderly, haggard woman riding a broomstick. Thirteen mischievous men represent Christmas in Iceland. They resemble Santa Claus’ costume, but they are much smaller in size. Each Yule Lad has a distinct personality, and they are believed to spy on young children throughout the year to determine if they deserve gifts or not. Good children receive gifts in their shoes for thirteen nights leading up to Christmas. Bad children receive rotten potatoes! Jultomten (pronounced YUL-tomten) is believed to be a group of gnome-like creatures. They also wear red coats and drive a sleigh, but citizens of Sweden, Finland, and Norway don’t believe that their sleighs can fly. Jultomton lives in the Scandinavian woods, and leave gifts right at the front door. Translated to “Old Man Frost,” Ded Moroz represents the Russian version of Father Christmas. He has a long white beard, wears a floor-length fur coat, and travels with a magic staff. Ded Moroz drives a troika, a horse-drawn sled, and delivers presents to good boys and girls! He is always accompanied by his granddaughter, The Snow Maiden. This entry was posted on Wednesday, December 20th, 2017	at 9:33 am	. You can follow any responses to this entry through the RSS 2.0	feed. Both comments and pings are currently closed.